This technique shows the underfloor heating pipe installed onto a suspended timber floor. The output from the floor is less per linear metre of pipe than for a concrete floor, so to compensate for this the pipe is placed closer together. The underfloor heating is installed wholly above the floor joists. A sub-layer of sterling board or plywood is fixed onto the joists, and 25/30mm x 50mm battens are screwed through the plywood into the joists beneath. The ends of the battens are left short to allow the underfloor heating pipes to pass from one space to the next. Battens are also fixed around the perimeter of the room. 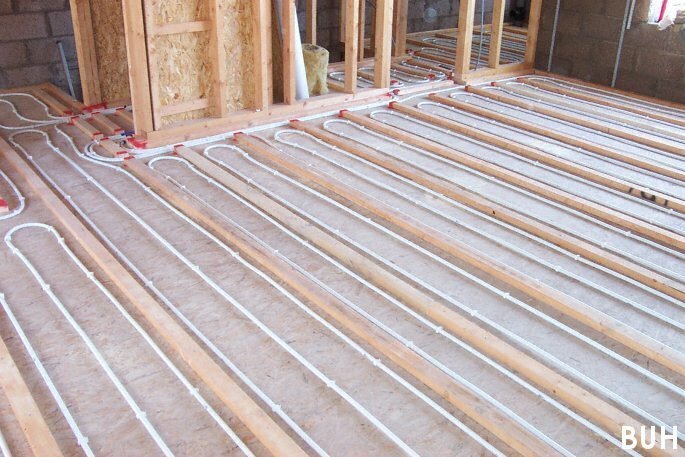 The underfloor heating pipes are fixed to the plywood using hammer clips. The space around the pipes is then filled in with a weak semi-dry sand/cement mix. This provides the thermal mass and conducts the heat from the underfloor heating pipes to the underside of the floor covering. It is important to make sure that the space is fully infilled to the top of the battens since continuous contact must be maintained from the floor pipes to the floor surface. Heat does not transfer well through air, so no air gaps can be left. Chipboard, ply or hardwood can then be screwed into the battens, depending on the final floor covering. If tiling, use at least 15mm plywood and a flexible adhesive.